The Port of Tilbury’s award-winning Logistics Training Academy in partnership with the Tilbury on the Thames Trust (TTT) has welcomed the arrival of a new state of the art ‘fully immersive’ training simulator as part of the ‘Attention to Logistics’ training programme. The ‘Attention to Logistics’ training programme and bursary scheme, launched last year by the Trust, has been created to specifically focus on the veteran community, helping ex-service men and women and their families back into work through the logistics sector. The programme will be delivered by Tilbury on the Thames Trust in partnership with the Port of Tilbury Logistics Academy. The Vortex ship to shore and straddle carrier simulator, purchased by the Trust from global leader in simulation-based solutions, CM Labs Simulations of Montreal, was delivered in a container to London Container Terminal in Tilbury. 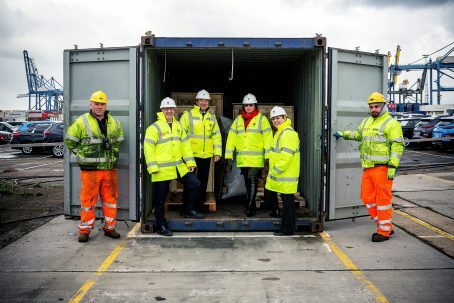 The container was opened by Thurrock MP, Jackie-Doyle Price and Stuart Wallace, Chief Operating Officer at Forth Ports and Chair of Tilbury on the Thames Trust. Utilising 13 screens and 270 degree views, the Vortex simulator provides full simulation of all the major crane and straddle operational components such as motion, cable and lifting systems, and lift apparatus. It will provide new operators with an enhanced learning environment featuring industrial controls and realistic working terminal scenarios. The Simulator will also provide valuable experience and important operational information that prepares them for, and complements, learning on a real terminal – for both crane and straddle operations. In addition to this, the Vortex simulator can be used to train operators how to react properly to operational hazards that cannot be safely trained for on a real operational terminal; this may include overloads, bad weather, and equipment failures. The Trust has also purchased a second simulator by Tenstar which is already in use as part of the Academy’s state of the art technology suite. This Tenstar training simulator has a full four screen surround and touch panel screen setup which enhances the feeling of working in an actual machine. With the Veterans programme in mind, the TTT specified the simulator to be equipped with Front Loading Shovel, Counter Balanced Forklift and HGV Truck with Trailer simulation software. In addition, the simulator is also virtual reality ready with the necessary programmes and cabling being fitted for the future addition of Oculus Rift VR equipment. The Logistics Training Academy is located within the port estate and also offers skills development and training to the port workforce and the community alongside developing a centre of excellence in training for the Logistics Sector.